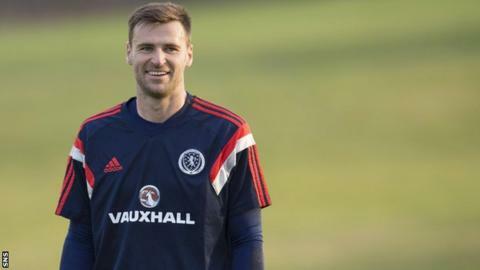 It's been nearly eight years since David Marshall last visited Celtic Park, an astonishing fact given how much the club meant to him as a boy and as a young goalkeeper making his way in the game. Eight years since he left and even longer since he last played there. Now we're really going back in time. The visitors on that August day in 2006 were a Hibs team including Scott Brown, Steven Whittaker and Steven Fletcher. In Celtic's ranks - Marshall and Aiden McGeady. Spot the odd man out. Brown opened the scoring, but the game was won with two goals in four minutes from Maciej Zurawski and Jan Vennegoor of Hesselink. "Wow! Long time ago," says Marshall with a smile. "Aye, I left for Norwich in January 2007 and I've never been back to Celtic Park since. Not on purpose, but it's just the way things have worked out. I've been to a few Old Firm games at Ibrox, but never Celtic Park. Strange, isn't it? For years I was never out of the place." Marshall is such an engaging character. Funny and thoughtful. His return to the east end of Glasgow will be exhilarating. Not just because he's going back to a ground that was once very special to him but because he's going back as number one, a status that was so often denied him when he was a Celtic player. There is no bitterness and not a lot of regret. It's the way of things, he says. He made his Celtic debut at 17 and came on as a sub in that storied Uefa Cup game against Barcelona having just turned 19. He had Martin O'Neill as a manager and then Gordon Strachan. He had Roy Keane as a team-mate, if only for a little while. He laughs at the connections to Friday night. The Republic of Ireland manager gave him his big break. The Republic of Ireland assistant manager was one whose every word he hung on. The Republic of Ireland's most creative player, McGeady, was one of his best mates. "When you think about it that way, it's a bit weird. I never had any real relationship with Martin when he was Celtic manager, purely because I was really young. I'll always be grateful to him, though. "The return leg against Barca (Rab Douglas was suspended) was incredible. At the time we had Magnus Hedman on loan in Italy and I expected the manager to call him back. Right up until the time we travelled to Barcelona, I expected Magnus to appear, but me and another young boy, Michael McGovern, went. If Martin doesn't give me that chance then you never know where you would be." Enter Strachan. Marshall started in those fateful games against Artmedia Bratislava and Motherwell, the first of Strachan's reign, a 5-0 defeat and a 4-4 draw. "Before those games, I thought this was my big chance to kick-on as a Celtic player. "Going down to Norwich, you're straightway involved in a relegation battle and you're relied upon heavily. That pressure and responsibility was a great way to learn. I was only 22 and it was the making of me." "Rab and Magnus had left, so I thought things were opening up for me. But you can't concede five and four and people not question you. At Celtic, you can't do that and expect to keep your place as a defender or a goalkeeper. "Artur (Boruc) came in and, for 18 months, he was incredible. I was never in a position to chap the manager's door and say I should be playing because Artur was probably one of the best goalies they ever had at the club. "I didn't see it as a lack of faith in me. It was just that Artur was brilliant. I got games here and there. In and out, in and out. "Roy came to the club and he surprised me because he took a lot of time with the young boys. He was really good. Even at dinner, he would always come over and sit with us. We had a tight group at the time - myself, Aiden, Ross Wallace, Craig Beattie. We all looked up to him. We had lots of questions for him. We all wanted to see how he worked." Marshall played in Keane's last-ever game - a 2-0 home win against Kilmarnock in May 2006. Soon enough, he also left Celtic, heading to Norwich, where we played 100 games and then to Cardiff, where he has played more than 200. He's the reigning player of the year and captain of a club that has known volcanic activity in recent times. "You never want to leave a club like Celtic, but it had to happen. I needed to play and playing all those games for Norwich was huge for me. It was - and is - very different in England. At Celtic, the team was so much about Henrik Larsson, Chris Sutton, John Hartson and the other big-name players. It wasn't easy, but you always felt that those guys were going to win the game for you no matter what. "But going down to Norwich, you're straightway involved in a relegation battle and you're relied upon heavily. The mindset changed overnight. One minute, I was a young player who was in the shadow of the big players and next thing I was starting every game and was being relied upon. That pressure and responsibility was a great way to learn. I was only 22 and it was the making of me." He's 29 now and is back in the Championship with Cardiff after a season in the Premiership. It's a grind in the second-tier, a Tuesday-Saturday, Tuesday-Saturday marathon that most thought he would be spared after a stellar time in the big league last season. Marshall was a remarkable performer for Cardiff against all-comers. He made more saves than any other goalkeeper in the division and was hotly tipped for a move to Arsenal or Southampton. "Yeah, there were a lot of rumours. I think there was some interest in the summer, but it never got to me, it was all done between Cardiff and other clubs. I never had to make a decision so I never got to the stage where I thought I would leave. "You hear about it and you have mates who tell you about it. And my brother, who's football daft, would give me a phone, but it was in the summer, so that's okay. If it was in January, it might have been tougher to get on with the football. "Cardiff has been the best time in my career. We've had our ups and downs for sure. The stuff with Malky (Mackay, the former manager) was played out mid-season, which is never great. There was so much pressure on us with a new manager coming in and, when he came in, we had Man United, Arsenal and Man City, so it couldn't have worked out any worse. It's more stable now. Russell (Slade, the current manager) is in now and he's been great. We'll pick it up, I'm sure. We won't be far away come the end of the season." Marshall is in his pomp right now. Hugely valued at his club and number one for his country despite intense competition for the jersey. He is where he always dreamed of being. He talks about his early years playing for Scotland and how they all fed into what he is today. The pummellings by Hungary and Sweden and Norway and Wales. The feeling that, no matter what he did between the sticks for Scotland, it was always going to end in despair. "It called for a bit of mental strength, I suppose. I mean, there were those games we lost badly and there were other times when I was in the squad and not getting a game or maybe not even getting on the bench. You're away from the family for 10 days and you've nothing to show for it. Some challenging times, but you stick at it and the chances fall your way." It was nothing to do with chance, of course. Marshall has earned it through his excellence. Friday night, he says, will be an extraordinary occasion - a game Scotland must win. "There's a lot of desperation out there from fans to qualify and you can completely understand that. We all share it. "We've started reasonably well, but we've got to win home games now. There won't be a lot in it. They have Aiden and he's become a big player for them. When they beat Georgia in the last minute, I asked afterwards who scored and they said Aiden and I said, 'Aye, thought it might be him'. "Then I saw the goal and I smiled to myself because I've seen him do that turn a hundred times at Celtic. Just brilliant. We'll be watching for that on Friday. He won't be getting away with that again." These are the nights you dream about, he says. The return to Celtic Park, after all these years.